The 1960s were the decade the muscle cars were introduced. Ever since then car buffs around the world that favor horsepower have been talking about them. The celebrated models are probably well known to all. You don’t have to be a car enthusiast to know about the Chevrolet Camaro, the Ford Mustang, and the Dodge Challenger. The first generation of the Camaro had its run from 1967 through 1970. The car featured a unibody structure, a separate steel rail subframe, double A-arms to serve as the independent front suspension, solid rear axle with semi-elliptical leaf springs, drum brakes on all four wheels, and a straight six 230-cubic inch engine that generated 140-horsepower that was mated to a three-speed manual transmission. More engines were available as options including a 250-cubic inch six that produced 155-horssepower, a 327-cubic inch two-barrel carburetor small-block V8 that offered 210-horsepower, a 327-cubic inch four-barrel carburetor small-block V8 that generated 275-horsepower, and two versions of a 396-cubic inch big-block V8 that produced either 325 or 375-horsepower. Along with those engines was a choice of wide or short-ratio 3 or 4-speed manual transmissions, two automatics -- 2-speed Powerglide or 3-speed Turbohydramatic. Race buffs could get their hands on the Camaro Z/28, which was unveiled in December 1966. A special high-compression 302-cubic inch V8, which was a combination of the short-stroke cranked 283-cubic inch V8 and the big-bore block 327-cubic inch V8. This engine had a rating of 290-horsepower. Did that first Camaro perform up to muscle car standards? Car Life Magazine tested an SS-350 in a quarter-mile and it was timed at 15.8-seconds at 89-mph. Motor Trend did its own test and the SS-350 finished the quarter-mile in 15.4-seconds at 90 mph. In 1969, Chevrolet made some changes in the engines. A 200-horsepower 307-cubic inch small block V8 and a new 255-horsepower 350 replaced the 327. The real powerful engines were assigned to the COPO. They were a 427-cubic inch V8 with an all-iron big-block that generated an awesome 425-horsepower and an all-aluminum ZL 427-cubic inch V8 that was also rated at 425-horsepower. The second-generation of the Camaro ran from 1970-1/2 through 1981. Most of the engines that powered this generation were the same as powered the models of the later portion of the first generation. The only change came in the Z/28, which was running on a 360-horsepower high-compression 350-cubic inch LT-1. Car and Driver ran the Z/28 in a 0-60-mph test and it delivered, achieving 60-mph in 5.8-seconds. The magazine also ran it in a quarter-mile and the results were 14.2-seconds at 100.3-mph. By 1980 Chevrolet, along with the other American car manufacturers, were concerned with fuel economy. As a result, the Camaro was given engines that sipped less gasoline, but also produced a lot less horsepower. The engines included a 115-horsepower 229-cubic inch V6, a 110-horsepower 231-cubic inch V6, that powered Camaros in California, and a 267-cubic inch two-barrel small-block V8 that achieved 120-horsepower. The Z/28 was assigned a 350-cubic inch V8 that produced 190-horsepower while a 305-cubic inch V8 that produced 155-horsepower powered these cars in California. Fuel economy trumped horsepower for the third-generation Camaros (1982-1992). With the start of this generation the Camaro had experienced a redesign and was smaller. The 4-cylinder engines included fuel injection for the first time and were mated to a 4-speed automatic transmission and 5-speed manual transmission. The base model featured a 2.5-liter engine that produced 90-horsepower. Engine options included a 2.8-liter V6 that offered 112-horsepower or a 5-liter four-barrel carbureted small-block V8 that was rated at 145-horsepower. The V8 engine was reserved for the Z28 and buyers of this model could also choose a Cross-Fire Injection (throttle body-injected) version that offered 165 horsepower. 1984 saw the introduction of the L69 engine, which was assigned to the Z28. However, a leap in performance was experienced in 1985 when the IROC-Z, named after the International Race of Champions, was introduced. By 1987 big engines were again powering the Camaros. The four-cylinder engine and the 5.0-liter carbureted V8 were dropped and replaced with a new carbureted 5.0-liter V8 that offered 165-horsepower, which became standard on the Z28. Dodge started sponsoring the International Race of Champions in 1990. So the IROC Camaro made its last appearance that year. New 2.8-liter and 3.1-liter V6 engines appeared that delivered from 135 to 140-horsepower. 1993-2002 marked the fourth generation of the Camaro. Highlights included the GM 3.8-liter V6 being used as an option on the 1995 Z28. By 1996, it became the only V6 to power Camaros. With the use of this engine, the least powerful 1996 Camaro had more power than the most powerful 1984 Camaro. Despite the introduction of some of these engines, the limited horsepower provided in comparison to the 1960s models and the country’s concern for fuel economy over horsepower caused the demise of the Camaro. After an eight-year hiatus, during which Camaro Concept Cars were showcased, the production Camaro returned in 2010 and marked the beginning of the fifth-generation of the car. New GM engines were used to power the fifth-generation (2010-2015) models including the base LS, midlevel LT and a V8 and the cars resembled the 1969 model. The LS and LT engines are 3.6-liter V6s with direct-injection that produces a head-turning 304-horsepower. The engines are mated to a 6-speed manual transmission or a 6-speed automatic that is available as an option. The SS model is now the top dog getting a 6.2-liter V8 that produces 426-horsepower and mated to a 6-speed manual transmission or 400-horsepower that is integrated with a 6-speed automatic. The car has been timed 0-60 mph in 6.0-seconds and a quarter-mile time of 14.2-seconds. There is also a 6.2-liter V8 that generates 426-horsepower working with a 6-speed manual transmission or 400-horsepower mated to a 6-speed automatic serving as optional powertrains for the SS. The car powered by this engine achieves the 0-60 in 5-seconds and finishes the quarter-mile in 13-seconds. 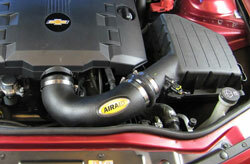 For someone who is driving a fifth generation Camaro with a 3.6-liter V6 and looking to increase performance, take a look at the AIRAID 250-715 Jr. kit. Constructed to help boost horsepower and acceleration, the kit is designed to replace the restrictive factory intake system including the intake tube and paper filter, but retain the factory air box. The AIRAID 250-715 Jr. Kit includes an AIRAID 850-427 washable and reusable direct-fit replacement air filter, a modular, low restriction polyethylene intake tube, four stainless steel clamps, and two couplers. The air filter features a cotton gauze media that is treated with a special grade of oil that makes the cotton strands very sticky. 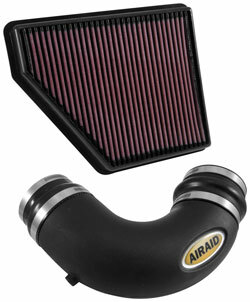 AIRAID also offers the AIRAID 790-550 Air Filter Cleaning Kit that is specially formulated to cleanse and recharge the air filter so it can be used over and over again for the life of the car. The Jr. Kit straightens the route and improves the flow of clean air to the engine. It can be installed using common hand tools in about 90 minutes.